We cordially invite you to browse examples from our Wedding Cake catalog for inspiration. 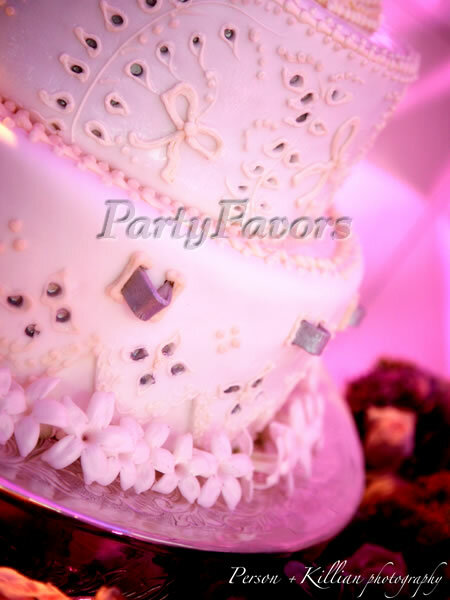 Custom wedding cake design is a signature service at Party Favors, but our catalog is a great starting point for creating the perfect design for your Wedding celebration. In addition to design, one must consider Cake Size as well as Flavors and Fillings in order to create the perfect Wedding cake. To simplify the process, Party Favors invites its wedding clients to Schedule a Tasting where we can work with you to get the right cake for your special day! This is a great opportunity to select just the right combination of flavors and textures, both of which make every wedding cake unique.